Working from home doesn’t necessarily mean that you have to fight with other household members over the only desk in your living room, or that you have to put earplugs in order to be able to focus. You deserve to have your own private area where you won’t be disturbed. Once you’ve decided which room you’ll use for your home office, you can move on to the decorating process. Any home office should be designed in a way that will contribute to productivity and concentration, and the minimalist style is the best approach for that purpose. The main feature of the minimalist approach is simplicity, and this is exactly why it is such a popular option for a home office design – you can easily concentrate on your work because there’s nothing to distract you in your surroundings. Therefore, you should opt for more neutral colours, such as pale blue, grey or green, beige, and, of course white. The combination of black and white is probably the most popular choice for home office décor – it sets a note of elegance and sophistication. If you don’t have much space, bright colours - especially white - will make your room seem bigger, so you won’t feel cramped. Additionally, you should leave the ceiling white and paint the walls and floor differently so as to create a contrast. Finally, monochromatic look is typical for minimalism, but if you want to add some additional colour, you can always paint one wall in a different shade. The matte finish has become increasingly popular in interior design, as it looks elegant, so if you like it, don’t hesitate to incorporate it into your home office. You can opt for the matte wall finish, however, if you feel like experimenting, you can try out something different and combine the matte and glossy finishes – for example, you can use a striped design for your walls, and make one stripe matte and the other one glossy, which will give an impression of two different shades of the same colour. Furthermore, you can use the matte finish for furniture, floor, or some smaller details. When it comes to materials, you should find a way to make use of natural materials, primarily wood. Hardwood floor is a perfect choice for a minimalist home study, and it can be paired up with shelves or desk. Another possible option is glass – you can use it for shelves, decoration details, and even as a desk surface, since it seems classy and modern. Minimalist approach emphasises clear lines, smooth surfaces and sharp angles, so remember to apply these principles when designing a minimalist home office. Having enough space is an important aspect of the minimalist approach, which means that you don’t need a sofa, several armchairs and a coffee table. Instead, focus on what you really need, and that’s a desk, a chair, bookshelves and a lamp. You can save some additional space by opting for a standing desks which fit perfectly in the entire minimalist concept. It also offers health benefits, since it enables you to switch between the sitting and standing positions, which is extremely important, if you spend a lot of time working. 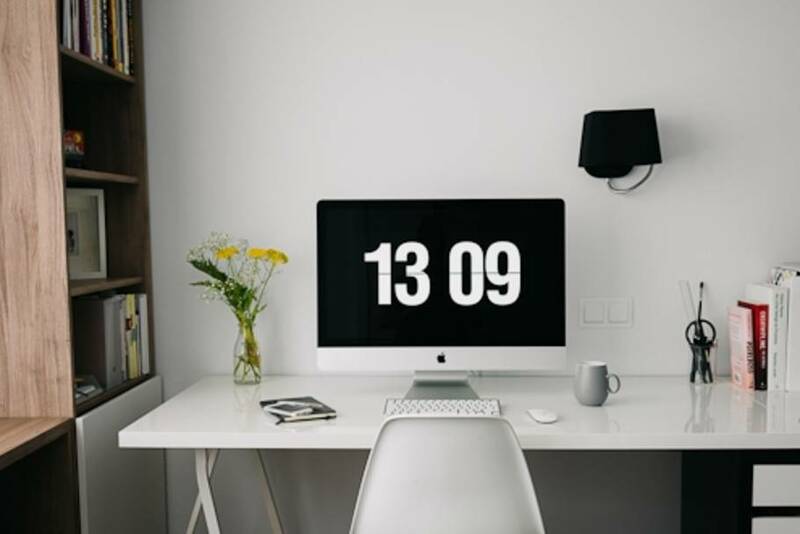 The minimalist approach follows the ‘less is more’ principle, so avoid cluttering your home office. You shouldn’t bring in useless items that will distract you, however, that doesn’t mean that you cannot decorate your office at all. Find a way to make your home study unique and make it reflect your personality. If you’re going for a monochromatic look, you can create a contrast by decorating the office with a colourful painting, or adding some other details in a different colour. The trick is in being moderate and finding a perfect balance, even if it means including just a couple of candles. If you have a small home office, you can solve this problem by incorporating a mirror to create an illusion of space. You can make your work area livelier by adding several plants, or using interesting wallpaper for one of your walls, but remember – don’t overdo it! If you want to decorate your home office in an elegant and simple style, the minimalist approach is the right choice for you! Additionally, it will maximise your productivity, since it won’t distract you from your work.